Using a document to perform a task is very different from reading a book. Take the work permit requirements on the left, for example. To find out what you need to know about atmospheric testing, you would have to read through most of the document. Users (in this case oil & gas field staff) typically don’t need all the information in this document - they need just the bits that apply to their field of expertise. The document, however, is written in classic technical documentation style which does not help them find the information they need. That list of bullets also doesn’t help. Science has shown us that human cognitive limits are reached at five bullet points - beyond that, and our ability to recall information drops dramatically. How fast can you find the information now? 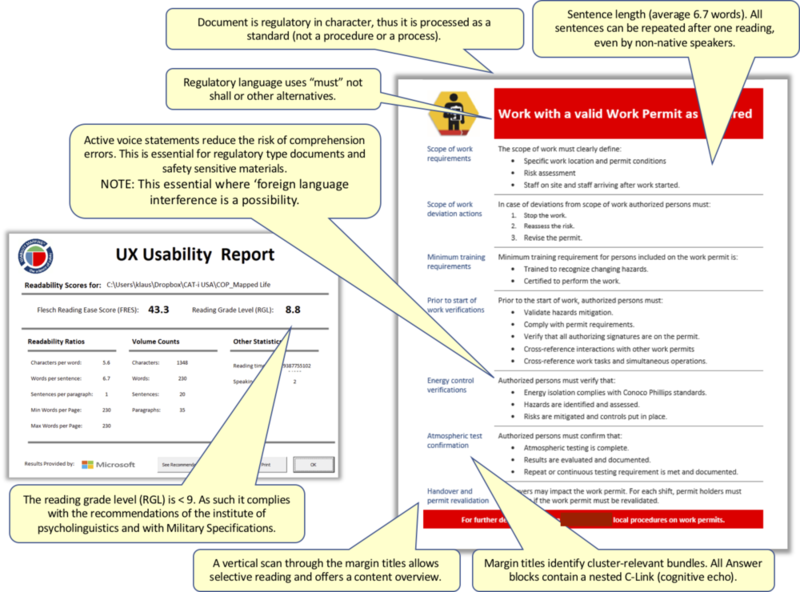 This is exactly the same document, with the same technical content, but with the principles of Usability Mapping applied to make a safer and more usable document. Note how easy it is to find information now. The margin titles allow you to quickly scan for the section you need. In each chunk of information, there are no more than five bullet points, ensuring that you can better remember and use the information you need. But there’s more to it than meets the eye. The type of language used in the document is designed to guide human behaviour (note the use of “must” instead of “should”). Cognitive links from the margin titles to the content helps users understand the information more accurately. This is a more usable - and safer - document. Advertisers have long known that the words we use - and how we present them - can be used to guide our behaviour. Researchers like Abraham Maslow, George Miller, Sir John Eccles and Jacob Kantor have taught us about principles like human cognitive limits (no more than 5 bullet points please), psycholinguistics (when to use command language) and gestalt psychology (how we use white space to group related information). This science, applied to written documentation, allows us to create documentation that guides human behaviour - even when you’re stressed or under time pressure. short sentences to help even non-native speakers understand and recall the information they need. This is the science of human cognitive behaviour applied to written documentation. The PQA (Promise, Question and Answer) construct is the most visible part of Usability Mapping. A title (Promise) at the top, margin titles (user Questions) down the side and Answers in the body. But like most science, this is not just a question of making things look pretty. Titles are “predictors”, not just labels. Margin titles help users scan to find the information they need, and are constructed with cognitive keywords (or C-link keywords). Answers (or instructions) contain a nested C-link (cognitive link) with stem statements for more accurate understanding. There’s a lot to the science - in fact, over 30 years of ongoing research and development. You don’t need to understand all of the science to create safer documentation, but you do have to care enough to give them every chance they have of getting home safely. Give them every chance possible of getting home safely tonight. Rather than rely on opinion, we can now create documentation based on the science of human cognitive behaviour. By embedding these principles in documents, we can guide users to do the right thing at the right time, even when under stress. provide a plug-in for Microsoft Word to make it easier to do this. We envision the day when no operator anywhere in the world has to perform a procedure that does not follow the principles of human cognition and behavior. Occasional announcements of upcoming events and monthly Usability Mapping tips. We respect your privacy. We will never spam you or reveal your information to anyone, and you can unsubscribe at any time.